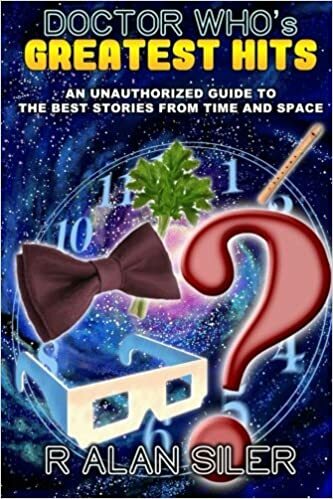 “The Ark In Space” – the second Tom Baker story takes place in an all-white futuristic setting. The first episode features no characters other than the Doctor and his companions wandering around this new world. Similarly, Bill and the Doctor are left alone to explore this all-white futuristic setting by themselves for a good chunk of the story. Plus, “Ark in Space” deals with another batch of colonists evacuating Earth and held in suspended animation. For that matter, we should also look more recently to “The Beast Below”, Amy’s first proper trip in the TARDIS, to yet another group of evacuees from Earth. Lots of similarities, like Amy/Bill reviewing a rapid-fire visual history of Earth, and questions about where Scotland is post-evacuation. the far future, the “end of the world.” In “Smile”, the Doctor takes Bill on her first proper trip in the TARDIS and describes the day that they’ve landed as the “end of the world.” To extend the Rose parallel a bit further, the exterior shots when Bill and the Doctor walk from the TARDIS to the city look remarkably like the opening scenes of “New Earth”, in which the Doctor and Rose are in a large, open field on a sunny day, complete with things flying in the sky (okay, ships rather than a swarm of microbots, but still). Clearly, this episode is intending to evoke the wonder and newness of those early Rose seasons. “Snakedance” and “The Doctor’s Wife” – in the Fifth Doctor story “Snakedance” (1983), the Doctor must center himself and find the “still point”, a place of calm within himself. Here, the Doctor uses the term in a more pragmatic way, describing the nature of TARDIS travel: you don’t steer the TARDIS, you negotiate with it. “The still point between where you want to go and where you need to be.” In this context, it’s like a state of compromise. This refers back to “The Doctor’s Wife” (2011) in which the Doctor learns that the TARDIS doesn’t always take him where he wants to go but always takes him where he needs to be. It seems by the time of “Smile” he’s learned to bargain with the TARDIS’ intentions. 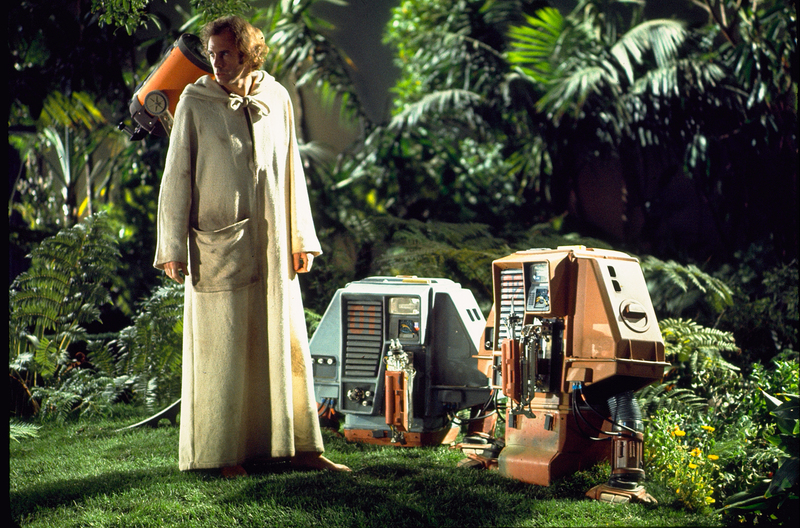 Silent Running – the 1974 film in which diminutive robots help Bruce Dern tend a garden. In space. Red Dwarf: “The End” – Lister awakes to learn that the whole crew of mining vessel is dead. He sifts his hands through piles of human remains, much in the way that Bill does here with the fertilizer. But at least Bill doesn’t taste it. Star Wars: The Empire Strikes Back – it’s a small thing, but the battle on the catwalk in the engine room reminded me visually of Luke and Vader’s big showdown. David Bowie – Upon reentering the city, the Doctor convinces the first emojibot that he sees that he’s happy – happy happy happy. “I’m happy, hope you’re happy too” he says, which is a quote from the Bowie song “Ashes to Ashes” – appropriate after having just found the ashes of all the colonists. And then, of course, “In the Forest of the Night”, the previous DW script by Frank Cottrell-Boyce – like “Forest”, the plot of “Smile” hinges upon a misunderstanding. In the first one, it’s the trees’ intent that is misunderstood by both the humans and the Doctor; in this one, the emojibots have misunderstood their programming and have enacted a solution to a problem that proves deadly to humans. And finally … The IT Crowd. I mean, c’mon, the resolution was the Doctor turning the machines off and turning them back on again. Really? And that’s plenty, I think. The point is that this episode borrows quite a bit from various sources. Is it intentional? i.e. is it meant to remind us of great moments in SF history? Or is it coincidental, like maybe Cottrell-Boyce has absorbed all these sources and has unintentionally regurgitated them? I think that at least the “End of the World” similarity is indeed intentional; with Stephen Moffat proclaiming this season as being a “back to basics” reboot, I think that the template laid out by the 2005 series is most definitely being followed. I will say that Bill and the Doctor are arguably the best pairing we’ve seen on the show in a long time. One Facebook friend, in reviewing this episode, said (I’m paraphrasing here, can’t find the exact quote now that I need it) that this wasn’t his favorite episode, but Peter Capaldi and Pearl Mackie are so good together that they can take a good episode and sell it as a great episode. I can agree with that; I find them to be as strong a pair as the Seventh Doctor and Ace. Bill continues to be well-written in this episode, with her seeing things from a different perspective, asking questions no one else would think to ask, like about the distance of the seats around the console. Her reactions to new situations are incredibly genuine and realistic, and the viewer can instantly connect with her believability. I was disappointed to see so little of Nardole this week, and I’m not sure where his overtly adverse reaction to Bill comes from, but I’m looking forward to seeing their relationship furthered (we see them hug in one of the trailers, so obviously things improve). 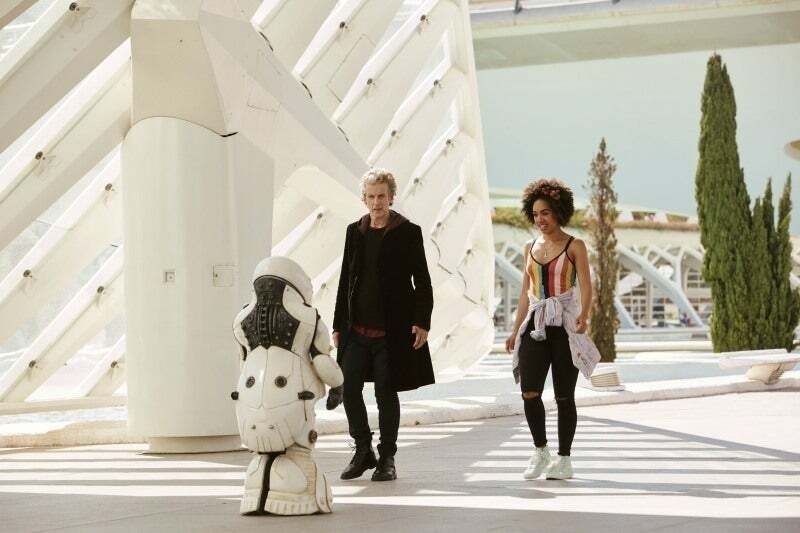 The setting – the City of Arts and Sciences in Valencia – is nothing short of spectacular, lending the episode a truly otherworldly and alien feel to it. It’s easy to forget that this structure is indeed in Spain! Built by Spanish architect Santiago Calatrava over a span of a decade (1998-2009), this massive complex is home to a science museum, an aquarium, an IMAX theatre, an opera house, a multipurpose event venue, a landscaped garden walk, etc. This structure alone makes “Smile” an on-screen standout. What to me is great about this episode, a trend that continues on from Series 9, is that it’s pretty much a standalone episode unencumbered by whatever the season arc is (all that stuff about the vault). It’s mentioned a few times, but it never intrudes on this episode’s territory, allowing it to tell its story without feeling rushed. While it’ll never go down as one of the greats, “Smile” was a perfectly enjoyable outing, helped mightily by the wonderful team of Capaldi and Mackie. I wish we were going to be getting more than one season of these two together. One final thing: When Bill and the Doctor were entering the spaceship, did you notice what was emblazoned on the hatch? Erehwon – ‘Nowhere’ spelled backward. Is that something that’s going to factor in down the pike? It’s most likely a reference to Erewhon (with the ‘w’ and ‘h’ reversed), an 1872 novel by Samuel Butler that takes place in a future Utopia. The difference is that Erewhon contains no machines at all, because of the fear that they would, through Darwinian evolution, develop consciousness and become dangerous. Maybe these colonists should have read that book. I was reminded pretty powerfully of the scenes on Miranda and Malcolm Reynolds finally getting the message out in ‘Serenity’.